IMD has announced the arrival of the Monsoon into Mumbai and Pune on the 11th. of June. IMD has based the arrival on certain criteria they have specified in their web site. Maybe, but the monsoon current, according to me is still lagging (as on writing this) at the Goa coast, and today is not strong enough to progress Northwards. The momentunm and push into Konkan will occur when the vortex is formed off the Goa/Konkan coast, and the off shore trough is energised with the resultant clouding. And, as I have said earlier,(10th.blog),this should happen from Monday,14th.The low as a counterpart system in the Arabian Sea off the Konkan coast could be formed as early as Sunday and should track off Konkan ( Mumbai included)-Gujarat coast by 15th. June. But, the Monsoon has progressed into parts of Telangana, coastal Andhra Pradesh. 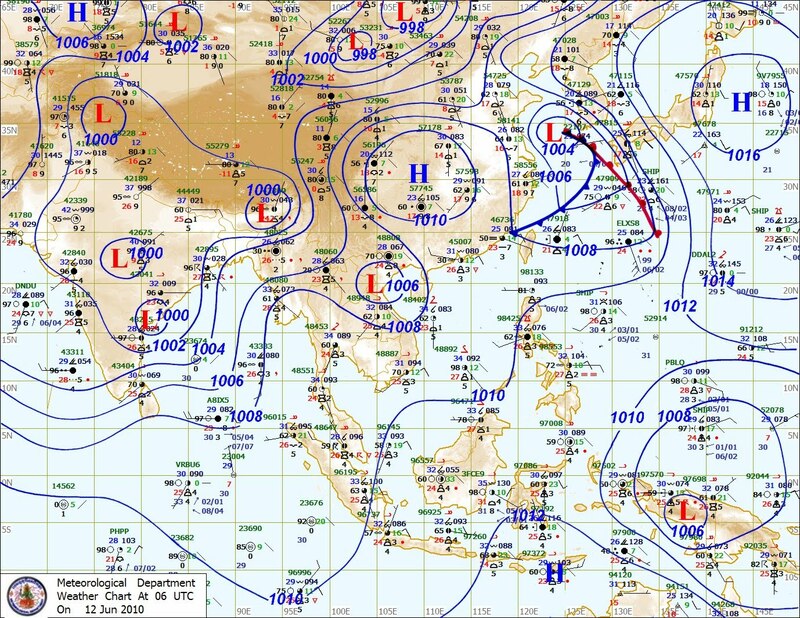 The rain accumaltion map(NRL) of 12th. June (day only) shows the rainfall along the A.P. and Orissa coast. Western region is devoid of meaningful rains, except in Kerala. Extreme Northern rains are due to an upper air W.D. Ok, in technical terms, we can say conditions are favourable for further advance into Maharashtra and Andhra Pradesh and southern parts of Gujarat, Chhattisgarh and Orissa during the next 2 days. 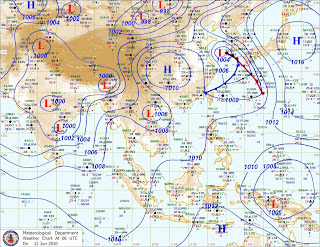 With the low pressure in the bay, now creating a "pulse" (see Thai Map) into the southern peninsula regions,monsoon winds flow over Arabian Sea and Bay of Bengal would further intensify during the next 2/3 days. 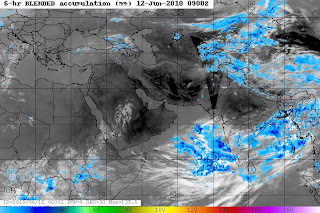 Meanwhile due to the formation of a good off shore trough along the west coast, very heavy rains are possible over north Kerala and adjoining coastal and south interior Karnataka. The required pre monsoon heat wave, discussed in the 9th blog, has resurfaced. Kota topped it today with 45.2c, and Delhi airport jumped to 44c. Several places have recoreded day temperatures in the 43-45c range. Systematically falling in place, against 1002 mb seen on the 9th, the core pressure has fallen to 998 mb.Now we can hope for the pressure in the seasonal low in the Sindh/Rajasthan region to fall a bit further and create the required gradiant to pull up and speed up the the monsoon winds along the Northern areas of the west coast. Mumbai: Rain on Friday (day and night); Colaba 1.7mm and Santa Cruz 1mm. Saturday no rain during the day. I stick to my earlier forecast, in fact I will copy/paste it from my blog dated 9th. "Sunday/Monday will be overcast and more rainy, with rains measuring upto 20 mms/day. Monday night and Tuesday will get very heavy rains, upto 150-200mms, with gusty winds. Typical monsoonish flooding weather on Tuesday,15th". Add: rains will extend into Wednesday. Unusually heavy winds (comparable to cyclonic one) tore through Panvel past midnight Sat-Sunday. Direction was from South-East, but no comparable rains.